The holidays have come and gone, but while we’re all resolving to eat healthier, my hard drive still has loads of photos showcasing the holiday season’s debauchery. And nothing spells debauchery better than Lechonok, a whole Cebu lechon, stuffed with lechon manok. What started out as a wild little idea, “I wonder what it would be like to stuff a whole chicken inside lechon?” turned into a full-fledged, intensely flavorful, sinful gastronomic delight that can make your heart stop with just the sheer thought of it. Has your heart stopped yet? 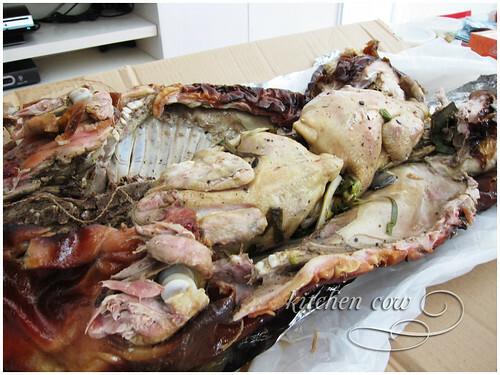 Gogoes Lechonok takes a whole lechon and stuffs it to the brim with whole chickens. Fill in the gaps with classic Cebu lechon herbs and spices, then roast to perfection. The lechon is superb. The pork flesh is really tender and juicy, and loaded with flavor. As is usual with good lechon Cebu, you can enjoy it without any additional sauces. The skin isn’t as crisp as I’d like; but Rayne, the work colleague who treated us to it, thinks it was just wrapped too soon, while it was still warm. Normally, it’s really crisp, he says. Nevertheless, it’s still really good lechon. I think it’s testament to its quality, the fact that we still enjoyed it thoroughly despite not having enough crisp skin to go around. The surprise though, is the lechon manok. Because of its placement inside the pig cavity, it absorbed all the drippings and herby flavors from the stuffing, intensifying its flavor. It’s missing the characteristic, brown skin of lechon manok but it’s not a deal breaker. In its place, you’re rewarded with rich, savory flavors, creating a lechon manok quite unlike ones I’ve tasted before. And like the lechon it comes in, you can enjoy it without any extra sauces. It’s that flavorful. 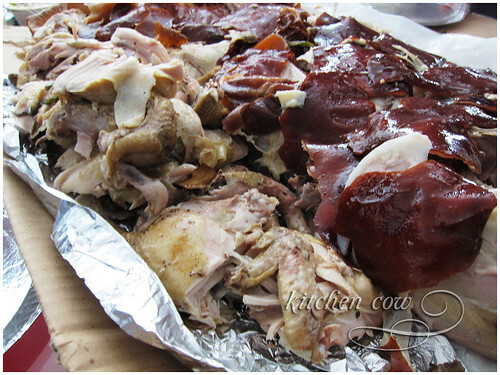 Splitting the whole lechon usually releases added drippings and juices too. Best to catch them for pouring atop your rice for the complete experience. Yum! Gogoes Cebu Lechon and Lechonok is sold in Lilo-an Cebu. I’m not sure if they regularly ship lechon to other parts of the country, but we were able to get some sent to Manila, so I’m sure if you’re nice, it can be arranged. And you better be nice before you eat it, because this sinful treat will hit your goodness quota bad. And here I thought they forced the pig to eat chickens. Hehe. But those photos are really really really sinful. If you watch How I met your Mother, it’s like Ted’s concept of stuffing a small turkey inside a bigger turkey, haha. Waaaaah drool drool here at 3:35am haha! 😀 Eto pala yung sinasabi mo sa plurk ah. Kagutom naman yan! This is super! gusto ko matikman yan! Hello Kao, long time no visit Wow I want to try that lechonok!! Sort of like a local version of turducken but waaay better hahaha! I had something like this in Enting’s in Bacolod last year. The skin wasn’t as crunchy as I want it to be but good enough, the chicken was superb! Nice to know that they have it in Cebu as well. Late reply is late! But it looks like we’re all in agreement. It must be tried, health be damned! HI TO ALL..!! this is Rigel the grand-daughter of the owner of GOGOES LECHON LILO-AN CEBU. Me and my family thanked you for posting our lechon at this site we really appreciate to what you’ve done, thank you really from the bottom of our heart’s thank you….!!!! AND AGAIN THANK YOU SO MUCH !!!!!! Thanks for the info, Rigel. I’ll edit the post to reflect your company’s contact info. I was pretty pleased to uncover this page. I need to to thank you for your time for this particularly wonderful read! this is mr.daniel bernardino,my family would like to thank you for posting and great comment about our LECHONNOK at this site. i and my family really appreciate all the effort you’ve doned…. as a sign of gratetude for a great compliment for lechonnok….would like to to send you a complimentary lechonnok. please…..send me your complete name,address and contact number. i will be glad to hear from you maam! I am so amazed when I see this Cebu Lechon that is stuffed with chicken. It really looks so tempting and definitely I would recommend this to my friends and family.Thanks you for this significant blog. Hopefully you’ll continually post new and informative article regarding with food.